Hurry over to BSN now and take advantage of this limited time offer to purchase brand new WFHS apparel. Make sure to order before school starts. Thanks for your support of WFHS athletics!!! The flyer below has all the information needed to order - and they ship directly to your house! Cougar Crazies! The Cougar Crazies is our school fan base. All students are a cougar crazy and we encourage everyone to come out to all events to support out school! The main organized events are football games, the “Cougar Crazies” stand together and cheer on our team Friday nights. It is not an official club and there is no form of admittance, the Cougar Crazies just serves as a base to share information and school spirit. We design a t-shirt every year with each grades graduating class and personalized name on the back that they can wear any where as awesome 'fan apparel’. If you would like to order a Cougar Crazies shirt for this year, please print off this order form and return with payment in an envelope to the front office. Deadline for all orders is Sept 1st. 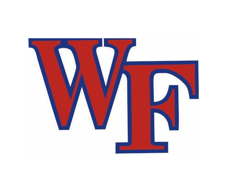 Help recognize Wake Forest High School standouts! Due to the threat of severe weather men’s lacrosse is canceled tonight.